Okay, so did any of you watch The Next Food Network Star during the summer of 2008? You know, with Kelsey, the perky little blonde girl (and now that it’s 6 years after I wrote this post, you know, Kelsey who has a best-selling cookbook and her own show on The Cooking Channel and an amazing line of products?) The one who made Sloppy Joes for a challenge and then had to serve them to Martha Stewart? And Martha Stewart wouldn’t eat them? (Click here for a very astute defense of the Sloppy Joe in reference to this incident.) Yeah, that’s kind of how I’m feeling today. The inner Martha in me is saying, “Really, Kate? Sloppy Joes?” And yet…what can I say? I think these are delicious. Like make-myself-another-half-sandwich-even-though-I’m-not-hungry delicious. Like sneak-into-the-kitchen-in-the-middle-of-the-night-to-see-if-the-mixture-tastes-good-cold delicious. Top it off with the fact that Sloppy Joes just feel like fall to me–you know, something warm and family-friendly that can simmer while everybody’s out trick-or-treating or something you can fill a thermos with and enjoy at a chilly football game. One thing I love is that it’s versatile–you can make it in about 30 minutes, it can be semi-prepared and frozen and then cooked in the crockpot, or it can simmer in the crockpot for a few hours, whatever works best for you. Some lean ground beef (I use 90% or 93% lean), seasoning salt (I actually use McCormick’s Montreal Steak Seasoning), ketchup, mustard, brown sugar, red vinegar, Worcestershire sauce, and tomato paste. 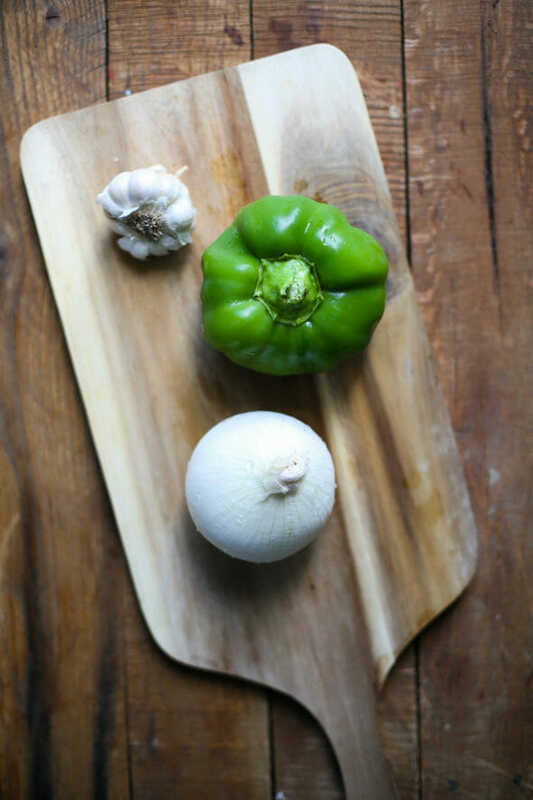 Chop the onion, garlic, and bell pepper. In a large skillet over medium heat, heat about 1 tablespoon extra virgin olive oil. When hot, add the beef and brown it, stirring frequently, with the onion, green pepper, and garlic. Season to taste with seasoning salt. Add in mustard, ketchup, brown sugar, red wine vinegar, and Worcestershire sauce. 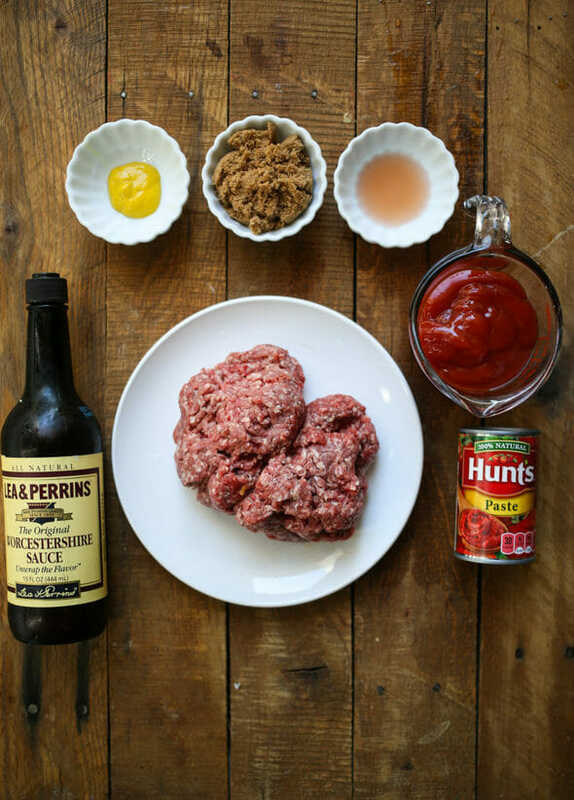 Combine tomato paste and water and add to hamburger mixture. Add more water if desired. Season with freshly ground black pepper to taste. Cover, turn heat to low, and simmer for 30 minutes, stirring occasionally. Serve on hamburger buns (we actually love them topped with pickles and served as sliders on King’s Hawaiian Rolls). If you want to make your own buns, try this recipe–it’s all kinds of amazing. Add in mustard, ketchup, brown sugar, red wine vinegar, and Worcestershire sauce. Combine tomato paste and water and add to hamburger mixture. Add more water if desired. Season with freshly ground black pepper to taste. Cover, turn heat to low, and simmer for 30 minutes, stirring occasionally. Serve on hamburger buns (we actually love them topped with pickles and served as sliders on King’s Hawaiian Rolls). Brown ground beef with onion, green pepper, and garlic. Season to taste with seasoning salt. Transfer to slow cooker. Add in remaining ingredients and combine well. Cook on low for 3-4 hours and serve on hamburger buns. Brown ground beef with onion, green pepper, and garlic. Season to taste with seasoning salt. Transfer to a freezer-safe container. Add in remaining ingredients and combine well. Freeze. When ready to cook, transfer to a slow cooker and cook on low to 3-5 hours. Serve on hamburger buns. MMMMMMMMMMmmmmmmmm That looks so yummy. I've never made a sloppy joe from scratch, I may have to try though because that looks positively delicious. We love sloppy joes and I've never made them from scratch either. These look DELISH! I just love new recipes and I pretty much have most of the items on hand. May have to try this and SOON. Martha really did that? Wow. hmmmm… I would never turn my nose up at a sloppy joe!! These looks pretty good! I'll have to add them to list of things to make for the hubs! Homemade rolls are going to be in order to go with these too! Lolly, she really did! She said, "I don't eat that kind of food." It was all very…weird. The thing that kills me is that she has a recipe for sloppy joes on her website! Luke loves sloppy Joes but I always refused to make it from the can. A couple of years ago i made it from scratch and now Luke won't even go back to the can. My recipe is very similar but It doesn't have mustard, I'll have to add and see how it taste. always make homemade Joes as I have NEVER liked the canned or packaged versions. This sounds like a great recipe too! We somehow have the same recipe as I just made these last night for dinner and the only difference is mine calls for crushed tomatoes rather than tomato paste. They are so good and I love that I can make a double batch and freeze the rest. I had just made buns the day before and they are a great pairing with it. Next time I will have to try it with the sweet potato fries and coleslaw …. yummy! Mmmmm these do sound delicious. The ingredient list sounds a lot like the one for our bbq'd brisket which is one of my favorite meals of all time! This would be a lot faster and easier though! My mom used to make sloppy joes for sunday dinners…. i think from a can though! looks yummy! Can't wait to try these with the fall weather here! Oh, and my husband is a traditionalist when it comes to eating them – just the meat mixture and bun. I like mine put under the broiler for just a couple minutes with a slice of colby-jack or sharp cheddar cheese. Yum!! Oh, and I can't believe Martha did that. How rude! This looks great. Any ideas for serving sloppy joes on something besides bread? My kids love the mix, but can't eat bread. There’s rice tortillas(not sure of the name) like a flat bread only made of rice and use them in a roll-up.. also a lettuce roll-up is good. Molly- you guys are gluten free, right? Is there some kind of gluten free pita you could use? I've gotta try these. I love Sloppy Joe's but the last time I got a can of the sauce and made them we were so disappointed…It was like the brand I have always bought, had changed the recipe or something. I have tried several made from scratch recipes, but DH didn't care for them. I am going to give yours a try next week. I am really wanting this to work, as all the canned varieties have HFCS in them. I am not anti HFCS, but I try to limit our intake. ALSO, we love ours with dill pickle slices and cheese on the bun. Yum yum! I LOVE sloppy joes and am so excited to try this recipe out. I have one that I really like but my husband is burnt out of it. So glad to have a new one to try. Oh, and poo on Martha Stewart. Love the counter argument from the link. Sloppy joes are my second favorite childhood sandwich (next to grilled cheese)! The only thing I do differently is not adding green pepper, but finely diced celery instead. Celery salt is a fine substitute as well. How rude of Martha! But then what do you expect of an ex-con:-) Really this is comfort food. Looks very much like my sloppy joe recipe… which over the years, has turned into throwing stuff into the pan without measuring, and adding different chopped veggies, depending on what I have around. But the fact is, I LOVE SLOPPY JOES. I would rather eat them than a burger. Even a homemade burger fresh off the grill. And I make a mean burger. But sloppy joes… a little sweet, a little savory, saucy… maybe some grated cheese on top. I LOVE THEM. I am definitely not a S.J. Snob. Not only that, but in a pinch, you can make sloppy joe meat into other meals. Add a can of grean beans, top with mashed potatoes and grated cheese and bake it for a few minutes, and it is Shepherd's Pie, American Style. Add a can of olives and a tablespoon of chili powder and some cumin, and pour cornbread batter over the top… and it is Tamale Pie. Not very highbrow. Martha would not approve. Tasty and family-friendly? YES. Oh My! I made these for my husband today and he literally moaned when he took a bite. I haven't made a sloppy joe recipe that he likes in a long time but now he can't stop telling me how delicious these are. This one is a winner! The only thing I changed was to substitute a red bell pepper for the green. Just personal preference. Hey Kate, the printer friendly version on this post brings up the last recipe. Just thought ya'll might like to know. I'm officially cooking one of your recipes tonight, and am making a goal to do at least one a week! Thanks! I made this for dinner last night and it really hit the spot. Maybe next time I'll make your homemade rolls. Just made this to re-heat for dinner tonight. It is crazy good! It's a good thing I have to go to work soon or there wouldn't be any left for dinner! Oh, and I used ground turkey instead of beef (spouse is allergic to beef). Yummy! I love homemade sloppy joes! Even better if I can freeze it too! Those are so not the sloppy joes my mother made! I must try them! I like cumin in my sloppy joes. Haven't had one in a long time. Thanks for sharing this wondeful recipe.. 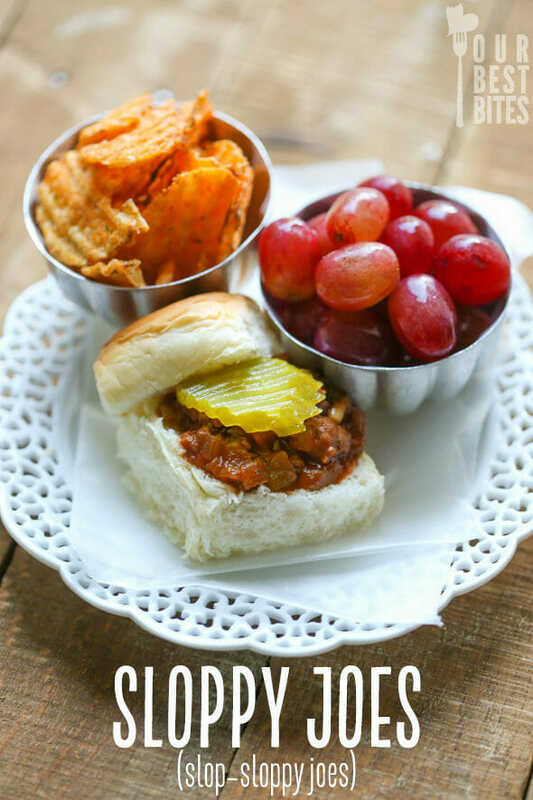 I had not tasted sloppy joes in such a long time and these are to die for! I catch myself making them at least once a week since we cannot get enough! Just wondering…are these super sweet? I tried a recipe from a book once that tasted like sugary meat…strange! PS. I tried your french dip recipe and it was FABULOUS!!! Thank you for sharing!!! Hi, Peri! I'm so glad you liked the French Dips. These are a little sweet, but not overwhelmingly so. I'm totally with you; I don't like my sloppy joes, BBQ Beef/pork, baked beans, etc. to be overly sweet. Thanks Kate! I am off to get the few ingredients I need to make them tonight. Can't wait to try one! Funny since Martha was on Oprah not too long ago and she said the biggest misconception about her was that you couldn't invite her to dinner because everyone thought their food wouldn't be good enough! Well she proved that on TNFNS with Kelsey. Martha even went on to say she loved grilled cheese and then cooked some for Oprah. It's all show! I'm making this sloppy joe recipe tonight and can't wait! This is one of my family’s new favorite meals. So easy and so tasty! Thank you! A definite success! This was the perfect mix for our family–not too sweet (for my husband), not too peppery (for me), and with some veggies mixed in (chopped up super fine, for my picky little eater). This will be the new sloppy joe recipe at our house for sure! Thanks! Love these! Love, love, LOVE. Pretty much my favorite sloppy joe EVER. And all my kids liked it, which was a definite bonus. These are amazing! I find myself making them again and again because they’re so delicious! My Husband and I made these for dinner tonight. They were a huge hit. The weren’t too spicy and they weren’t too sweet. They were the perfect blend. Our kids even ate them, which was surprising. I will be making these for a luncheon following my son’s baptism next month. yum, yum, yum, yum, yum! We ate these tonight with your oven-baked fries, and it was delicious all around! Best Sloppy Joe Recipe tried yet! Great recipe! If you like a bit more punch, spoon the meat onto the bottom bun, add a couple of dill pickle chips, a quarter-inch thick slice of Velveeta, and pop under a broiler until the cheese starts to melt… Ices the cake! These sounds so good and can be gluten free – yippeee! The hubby will be thrilled! Will try them this weekend in the crock pot! I love your blog – I’ve become addicted. These were great! Next time I will try making them in the crockpot! Sounds yummy, going to try tonight! Wow, so people actually do eat canned sloppy joe mix. gross!!! Yum! I used posh French wholegrain mustard and a red bell pepper. My onion was rotten when I cut it open, so I omitted it, and it still tasted fantastic! The deal-breaker ingredients are the ketchup and brown sugar….yummmmmm!!!! Fantastic recipe! I made tonight for dinner and hubby and daughter loved! The only thing I did different was added kidney beans to recipe, it was very yummy! These have now become my family’s favorite Sloppy Joe. My husband and son won’t even touch the stuff from a can anymore! Thanks for sharing! I got halfway into this recipe when I realized I didn’t have any brown sugar! I used molasses instead and they still turned out great. Thanks for the recipe, Kate! Yum! I made these for a dinner tonight and they were a hit with the whole family! I think I might use just a touch less sugar next time, just personal preference, but they were pretty tasty as is. Sloppy Joes are one of my husband’s favorites and he really liked these. Glad I have a homemade version to make now! I think next time I’ll plan to double the recipe and freeze half per your instructions. It would be nice to be able to pull a batch of these from the freezer! My husband liked it but since it was too sweet, all I could do was add more acid so I added more vinegar & threw in more Worcestshire. I didn’t have peppers & we aren’t really fans either so that didn’t matter. Next time, I’d cut back on the sugar. this recipe was really awesome thank you are the best. 7 years later and this is still our favorite Sloppy Joe recipe hands down!! Sloppy joes and French fries was our Halloween meal every year. I did the same with my kids and now my grandkids. They all think it wouldn’t be Halloween without sloppy joes. My kid developed a taste for sloppy joes at Boy Scout camp. Do you think I could make these with turkey? Maybe I’d cut back on the sugar, too.